Barclodiad y Gawres passage grave is rebuilt and to large extent consists of concrete, but it holds a unique value – six stones with prehistoric carvings. Once upon a time two giants – a man and his wife – were travelling to Anglesey. They planned to build a house there. Man was carrying two large stones under each arm – these were for the doorframe. Wife was carrying lots of smaller stones in her apron. On their way they met a cobbler. Giants did not know the surroundings and were not sure whether they are heading where they need – thus they asked a cobbler for correct way. Cobbler pointed in the right direction. "And how far should we go?" – giantess asked – she was tired already. Cobbler decided to make fun of giants. He looked down at his bag full with old shoes and said: "Very far! I have worn out all these shoes while I walked from there!" Giants were in despair. Man dropped his boulders and moaned, wife threw up her arms and all stones fell from the apron to the ground. Thus formed Barclodiad y Gawres – what in Welsh means "Giantess apronful". Barclodiad y Gawres is a cruciform passage grave: it has the main passage leading into the mound and two side chambers to each side of this main passage – forming a cross shape. This type of graves is more common in Ireland with such famous examples as Newgrange and Maes Howe. 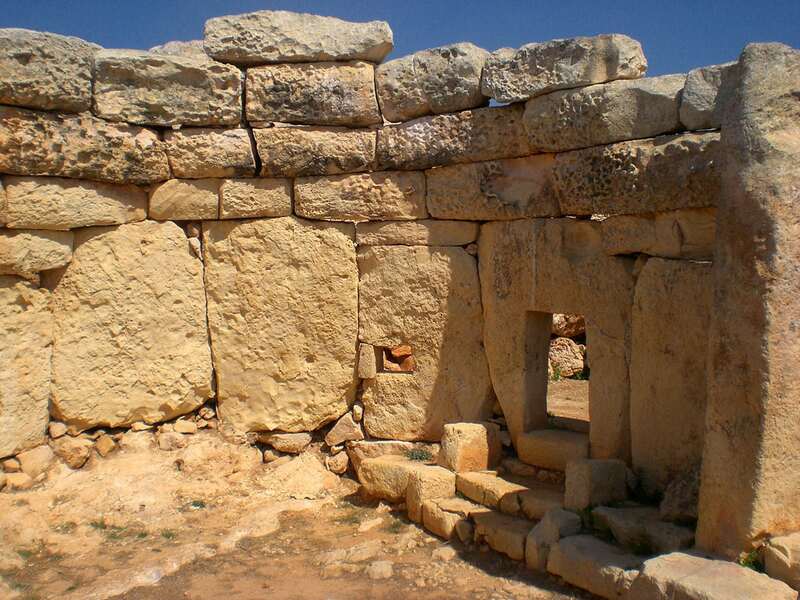 Judging from the architecture of this structure passage grave was built sometimes around 2300 – 2400 BC. The approximate diameter of the original mound was 20 m. Mound can be entered from the north, through a 6 – 7 m long passage. It opens in the main chamber, diameter of this room is approximately 6 m. To the south is a terminal chamber and to the east and west – two side chambers. In 1952 – 1953 there was organized a full excavation by T.G.E.Powell and G.E.Daniel. Unfortunately by this time the mound was heavily damaged: since the 18th century it was used as a source of construction stone. In order to preserve the remaining values, mound was rebuilt. Now it has a concrete roof covered with a turf. During the archaeological excavations researchers discovered several exciting things. 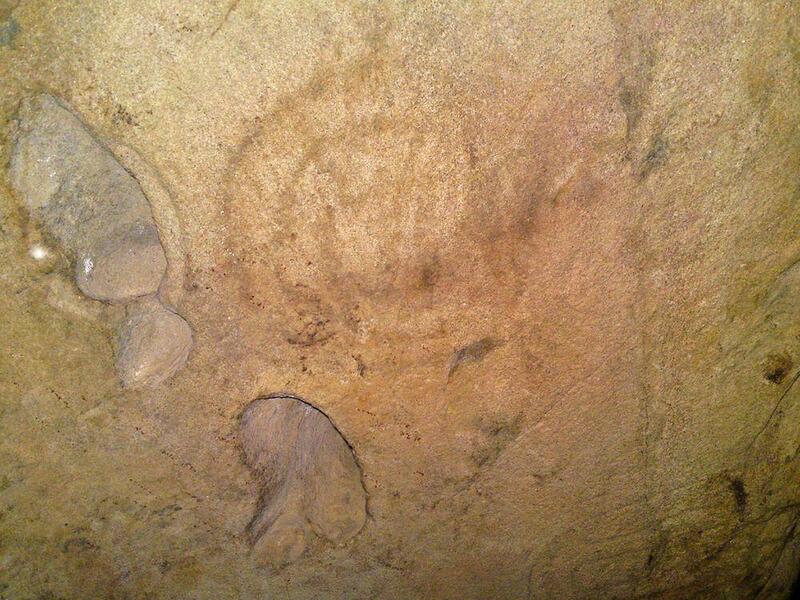 In the western side-chamber there were found the only remaining burials – cremated bones of two young men. Unusual was the discovery in the central chamber – here in the centre were located remains of fireplace. In this fireplace were found remnants of fish, frogs, toads, snake, mouse, hare. This weird stew was covered with limpet shells and pebbles. This unusual combination reminds stories about witchcraft and sorcery. 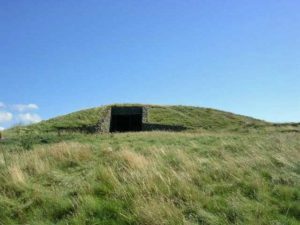 There is speculated that the ancient burial mound was used for the rituals of Celtic Druids, but nothing is known for certain. The best known feature of Barclodiad y Gawres is decorative stones. Powell and Daniel discovered five stones with carvings inside the mound, Maggie and Keith Davidson discovered carvings on the sixth stone in 2001. Stones are decorated with carvings of spirals, zig zags, cupmarks and other symbols. 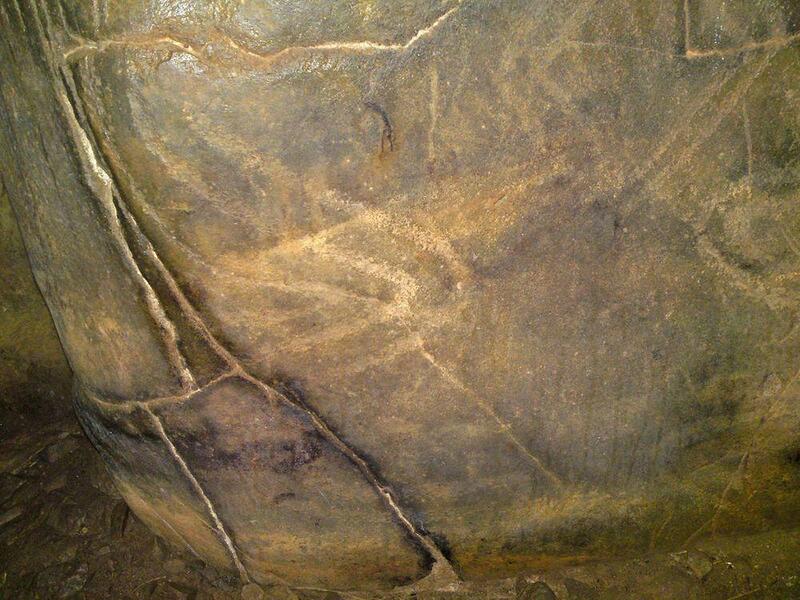 Especially impressive is the decoration of stone No.22 – it is covered with chevrons and lozenges. There are visitors who consider that the carvings on these six stones create an integrated design for the whole chamber. This looks like a matter of taste – some see such whole design, some not. Some people are just weird. Judge yourselves: several years ago everyone could enter the mound in the summer by asking the keys in the local store. One day somebody misused this great opportunity and sprayed on one of the decorated stones: LED ZEPPELIN, thus at once damaging a timeless monument of history and in a way – defaming a great musical act. Now the passage grave is available only in the presence of guide. People can not be trusted. Most amazing landmarks of Anglesey are its rich archaeological heritage and early medieval architecture. 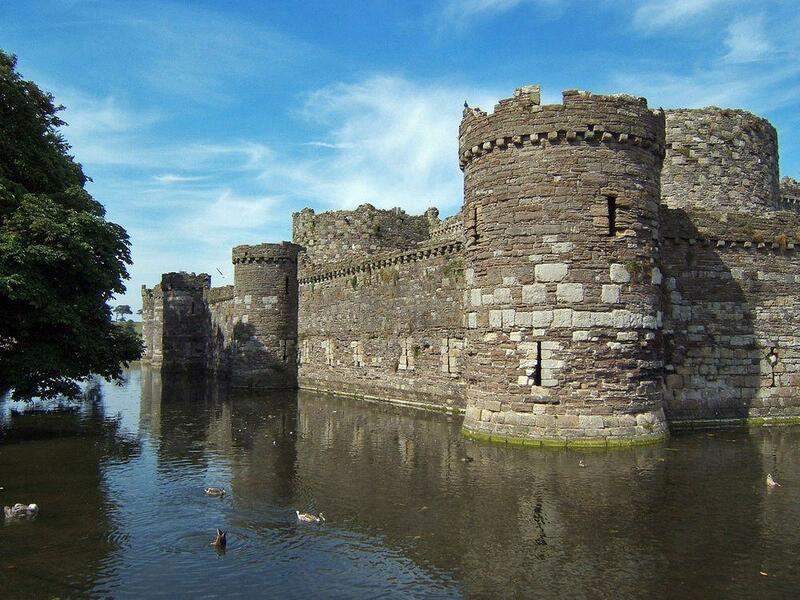 The extraordinary wealth of ancient and historical sites on the Welsh island of Anglesey represents a microcosm of British history, from the deep Neolithic past to the Roman occupation, through the rise of the Welsh princes to the heyday of the Victorian resort of Beaumaris. It was on Anglesey that the ancient Druids took their last stand against the Roman invaders. The world is bigger, more interesting and much more profound when you can attach a name and a story to a place. With that thought in mind, I welcome you to my fully illustrated book about Anglesey, My Hidden Gem. This is very much my book, my stories – amusing, eccentric and quirky – because it’s all about My journeys and My island home.